Baker Mayfield believes it is important to have the same mentality as Kobe Bryant when playing on the road after the Los Angeles Lakers legend visited the Cleveland Browns ahead of their away win over the Denver Broncos. The five-time NBA champion was a guest at the Browns' team meeting on Friday and provided the players with motivation going into Saturday's clash with the Broncos. 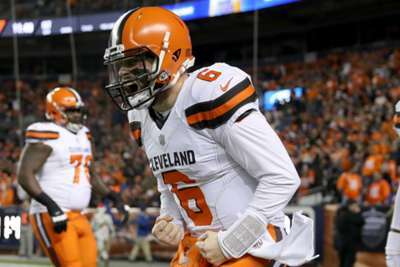 Cleveland subsequently claimed a narrow 17-16 victory to keep their playoff hopes alive and, though rookie quarterback Mayfield was unsure whether Bryant's visit had an impact, he was full of praise for the 18-time All-Star. "I have a tremendous amount of respect for Kobe, he's just one of those guys attitude-wise, there's nobody else in the world like him," Mayfield told a post-game media conference. "He's unbelievable, he was one of my idols growing up, I'm not good at basketball but just mentality-wise, work ethic, determination, will to win. "It was so awesome getting to hear from him, and he was so honest about everything and you normally don't get to hear that from somebody who's a legend like that. It was good for us to hear that and I really enjoyed it." Asked if Bryant's pep talk had an influence on the hard-fought triumph, Mayfield replied: "Getting our guys to believe in it and do their job, that was one thing he kept harping on [about]. "It doesn't matter what anybody else does, you've got to do your job first and foremost, after that you can start worrying about the big picture. Maybe it did, maybe it didn't [have an impact], I definitely enjoyed it, though. Mentality-wise going on the road, having his mentality is pretty important." On the Browns' performance, he added: "Definitely wasn't our best game by any means but a win's a win. Coming out on the road, it's hard, and we did that. "Our guys scrapped until the clock hit zero, we found a way to win, doesn't matter how it happened. It obviously wasn't very pretty, that's why we get to watch film and learn from it. We won and we get to learn from it."